The age of the single senior housing community operator is going the way of the dodo and the dinosaur. Operators handling 10 or more properties account for 43% of all units in operation, according to data from the National Investment Center for Seniors Housing & Care (NIC), which revealed the data on the final day of its fall conference in Chicago as part of a panel with industry leaders from Revera Senior Living, Aegis Living and Cedarwood Senior Living. The data shows an aggressive eight-year period of consolidation by large operators, but that is just the beginning. Seniors are living longer — an average age of 79 years, according to 2015 data from the Census Bureau — and have gained 30 years of life expectancy between 1900 and 2000. “Living longer does not mean living better,” NIC Senior Director Lana Peck said. Historically, the seniors housing business has been one built on local connections and community ties. But with seniors living longer, baby boomers aging out of the workforce and a demand for skilled labor that will become more acute in future years, Peck believes the industry is getting ready to scale up even more. The percentage of independent living, assisted living and memory care communities operated by larger chains has grown from 2009 to 2017. “There will be further consolidation which will achieve greater operational efficiencies and better meet the needs of new residents that economies of scale can provide,” Peck said. As consolidation continues to gain favor, larger operators are attuned to the need to operate their assets, dictated by the needs of the community in which they are located. Companies like Mississauga, Ontario-based Revera, which operates 500 communities in the U.S., Canada and the UK, housing over 50,000 residents and employing over 45,000 workers, need to give their brands the freedom to operate on a local level, Revera SVP, Innovation and Strategic Partnerships Trish Barbato said. Revera gives its U.S. and UK brands the freedom to manage and market themselves in a way that befits the community. Revera’s Canadian holdings, conversely, are centrally managed. With that comes brand standards and tighter oversight. “You have to be careful about being too tight versus the freedom you need at the local level,” Barbato said. Regional operators, because of their scale, can control management and marketing more centrally, Aegis Living CFO Wally Jossart said. Each individual community needs to have its own identity and voice. Aegis developed and operates 31 senior living communities in Washington State, California and Nevada, and has five more under construction in Washington State. “With the clusters we’re in, we can manage messaging in a more efficient way centrally because of our reach in those markets,” Jossart said. NIC’s data indicates the ratio of caregivers to seniors over age 80 will shrink to 4:1 by 2030, and 3:1 by 2050. Having scale can help recruit new workers to the industry, especially when it comes to benefits. For smaller operators, benefits can be an issue, Cedarbrook Senior Living President Michael Damone said. Cedarbrook operates two communities in the greater Detroit area, and has a third under construction. For larger operators, workers are more concerned about their teams locally and the culture at a site level, Barbato said. “Most of our employees probably don’t know the size of our organization,” she said. 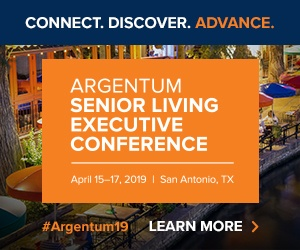 Aegis Living, Cedarbrook Senior Living, National Investment Center for Seniors Housing and Care, Revera Inc.